Ragtime: An Encyclopedia, Discography, and Sheetography is the definitive reference work for this important popular form of music that flourished from the 1890s through the 1920s, and was one of the key predecessors of jazz. It collects for the first time entries on all the important composers and performers, and descriptions of their works; a complete listing of all known published ragtime compositions, even those self-published and known only in single copies; and a complete discography from the cylinder era to today. It also represents the culmination of a lifetime’s research for its author, considered to be the foremost scholar of ragtime and early twentiethh-century popular music. Rare photographs accompany most entries, taken from the original sheets, newspapers, and other archival sources. 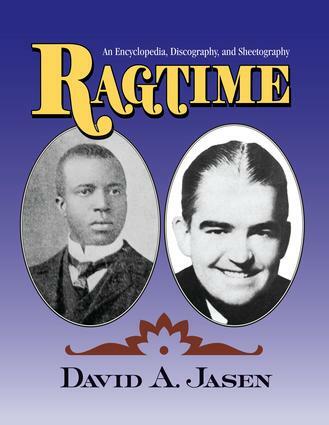 David A. Jasen is considered to be the world's foremost authority on ragtime music. He has studied, recorded, and performer ragtime music for over five decades; his publications include complete scores for many major ragtime composers, and several books on the history of the music. Additionally, he has authored for Routledge a number of other well-received and strong selling reference works, including Tin Pan Alley: An Encyclopedia and A Century of American Popular Song.